Google ends Adsense on Google sites. | NewbieTechTips! Google ends Adsense on Google sites. In continuation of ending products, Google announced yet another bad news. I don't know what Google is planning with it's products and services. I hope it is something good for billions of users who use Google every now and then. So its Yet another Google shutdown. 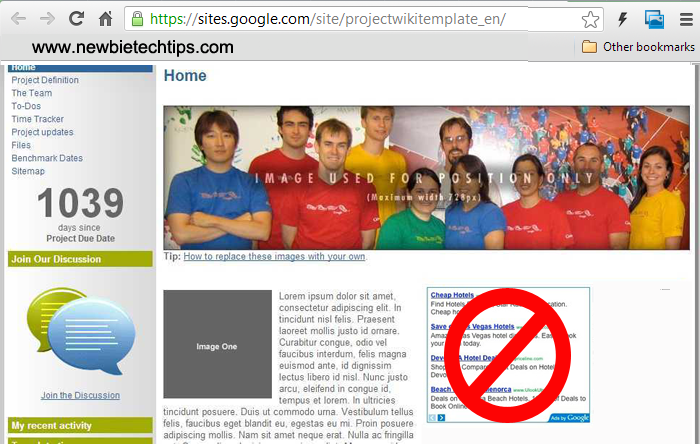 Google announced recently to stop adsense ads on Google Sites websites. Google also says that the existing ad units will not be affected, but users will not be able to add any more ad units from 31st Aug 2013. Google is sending out email to all the publishers who are serving ads on Google Sites and also posted the announcement here. "Starting August 30th 2013, it will no longer be possible to modify AdSense ad code on Google Sites pages. However, any ads you’ve previously placed on Google Sites will continue to show, and you’ll be credited for all valid earnings. No change is required on the part of AdSense users. Any ads that you currently have running will not be altered or removed, though you’ll be free to delete ads yourself. However, it will no longer be possible to edit or add new AdSense ads to your existing Google Sites site or to new pages. Please be assured that this update will not affect the standing of your AdSense account or ability to show ads on any other websites you own. If you’d like to show ads on other websites, simply log in to your AdSense account at www.google.com/adsense to generate new ad code at any time." Well frankly speaking I am not that upset with this news (as compared to the news of Reader shutdown and Gtalk to hangout conversion) as most of the Adsense publishers including me do not run their ads on Google Sites primarily.